Went in to work today and as usual, meals got a little sketchy. One of the guys working at my station today goes to Crossfit 818, so we planned out our day. I finally got around to breakfast around 10. 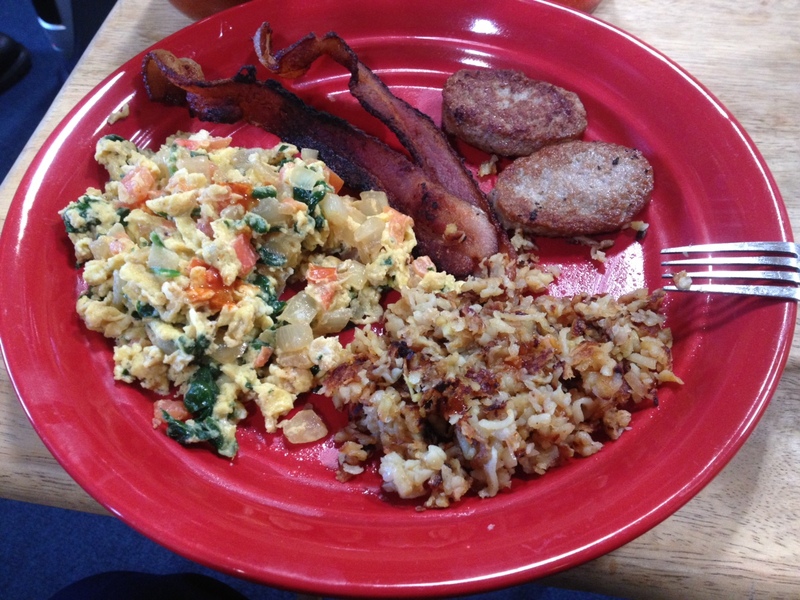 I threw together a junk scramble, sweet potato hash browns, sausage, and bacon…I love this lifestyle. We decided on having lettuce wraps for dinner tonight, but I didn’t create them. They were delicious, thanks to Tadeh for cooking. I had gotten hungry before dinner and had a hankering to make something new. I saw Louie’s post about the pancetta stuffed chicken and thought about how delicious it looked. But I realized, this wasn’t something I could just throw together. Pancetta isn’t something I keep stocked in my house, even though it’s delicious. So I sought out to create something new. I would use Louie’s meals from this week to create my meal. So I grabbed the Not Your Dads Steak and Eggs recipe and blended it with the Pancetta Stuffed Chicken recipe. 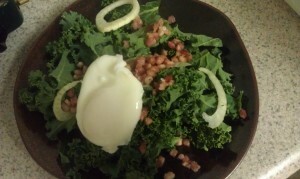 What I came up with was a kale salad with fennel dressed with our Lemon Vinaigrette. I then added some pancetta and a poached egg to finish the concoction. I think it shows that you can be creative with your meals by using the ingredients from other meals during the week and adding a little twist. Thank you to Louie for the motivation. Hopefully you try it out and enjoy the results. A simple salad recipe using ingredients from other meals this week. Step 1 Coat your kale greens and fennel with the vinaigrette and place on dish. Step 2 In a sauté pan over medium heat, add your pancetta and allow to crisp. Step 3 Spoon pancetta over kale, using some of the fat and heat to slightly wilt your greens. Step 4 In a shallow pot or sauce pan, add water and vinegar. Step 5 Allow water to come to a simmer and gently crack egg into pot, cooking one egg at a time. Step 6 When the white is firm and the yolk still runny, use a slotted spoon to pull egg from water and place on paper towel. Step 7 Gently pat excess water off of eggs and place on top of salad. POACHED EGG TIPS: When poaching an egg, always use a shallow amount of water and a tablespoon of white vinegar. The vinegar helps the egg white stay together, creating a more solid egg. I used Primal Primos Lemon Vinaigrette on this salad and it worked perfectly!